This weekend Japan Society presents three of Nikkatsu’s newly subtitled, full-color classics by prolific and versatile filmmaker Umetsugu Inoue. 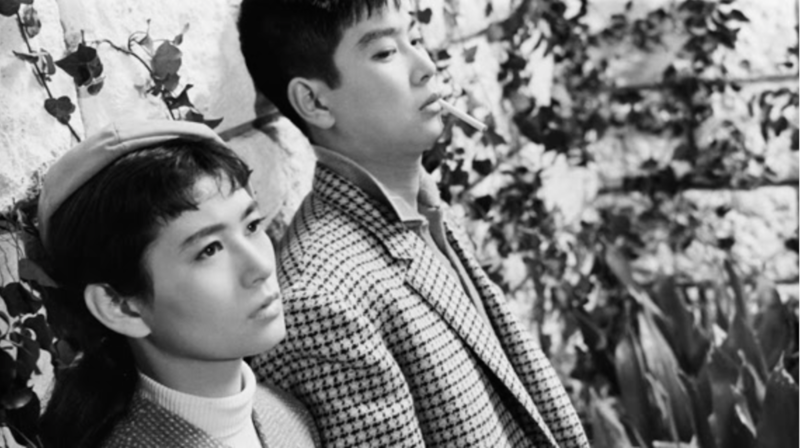 Inoue worked across a wide range of genres throughout his long career and made his mark at Nikkatsu Studios in the 1950s with a series of highly entertaining, genre-blending musical films that captured the explosive energy of Japan’s jazz-fueled youth culture. Each of the films being screened this weekend star heartthrob Yujiro Ishihara, the so-called “Japanese Elvis Presley” and the biggest male singing film star in postwar Japan. Saturday, December 15 at 2:15 p.m.
Sunday, December 16 at 6:45 p.m.
Eikichi, a nightclub owner and former boxer with unrealized dreams of being a prizefighter, picks up a talented but wildly undisciplined amateur fighter (Yujiro Ishihara) and decides to mold him into a champion. When a beautiful, destitute ballerina also comes under Eikichi’s tutelage, however, romantic entanglements and jealousies threaten to undo his vicarious triumph in the ring. A box office success upon release, The Winner proved to Inoue’s satisfaction that Ishihara could carry a film (though his studio bosses needed more convincing). It also established the action-with-musical-interludes template for dozens of Nikkatsu films to come. 1957, 115 min., DCP, color, in Japanese with English subtitles. Directed by UmetsuguInoue. With Yujiro Ishihara, Rentaro Mikuni, Ruriko Asaoka, Yumeji Tsukioka. 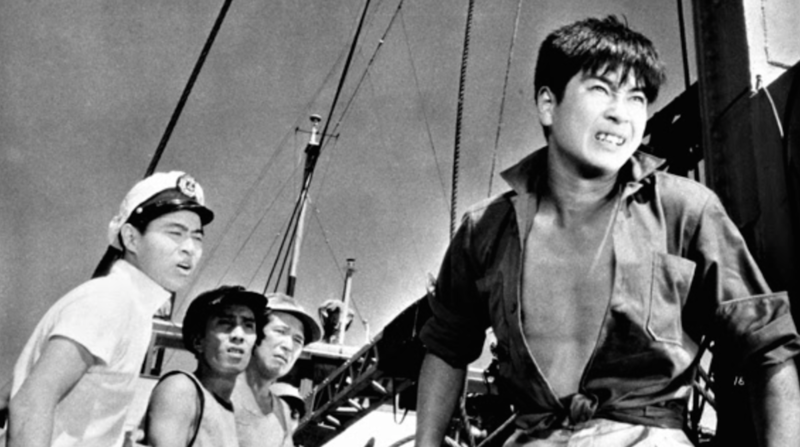 Saturday, December 15 at 4:30 p.m.
A high seas adventure, murder mystery, and revenge-driven melodrama all rolled into one, Inoue’s follow-up to The Winner casts Ishihara as a cocky, musical seaman who joins the crew of a rusty cargo ship headed to Hong Kong. Amidst fist fights and scuffles along the way, two women on board vie for the ukulele-playing sailor’s attention: a sultry stowaway and the captain’s high-spirited daughter, who is also pursued by the ship’s first mate. Morally ambiguous, Ishihara’s character offered something new to Japanese cinema: a dirty hero with his own sense of justice and a way with song. 1957, 101 min., DCP, color, in Japanese with English subtitles. Directed by Umetsugu Inoue. With Yujiro Ishihara, Kyoji Aoyama, Fukuko Sayo, Mie Kitahara. Sunday, December 16 at 4:30 p.m. In the movie that made him a star, Ishihara plays a rough-hewn drummer out to make it in the seedy Ginza jazz world. An enormous success, The Stormy Man was Japan’s third biggest box-office hit of 1957, made the Nikkatsu studio solvent, and solidified Inoue’s reputation as a maker of hit musicals. 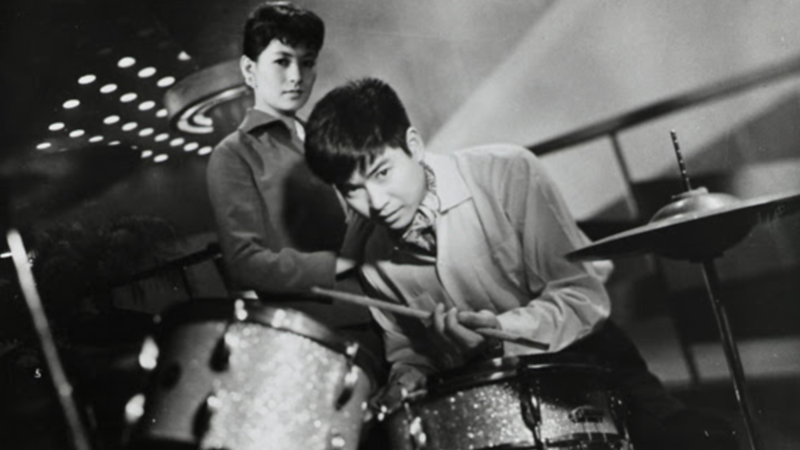 For its young audience, who clapped and cheered as Ishihara sang, “I’m a drummer, a no-good drummer,” the movie was an event and a generational marker. Today it still packs musical excitement—and presents Japan’s premier screen idol at his most charismatic. Japan Society is having a special offer: Purchase all three films in the same transaction and receive $2 off each ticket! For more information and to purchase tickets, please visit Japan Society’s website.